Blue Balliett BOOK LAUNCH - "Pieces and Players"
About the book: THE PIECES: Thirteen extremely valuable pieces of art have been stolen from one of the most secretive museums in the world. A Vermeer has vanished. A Manet is missing. And nobody has any idea where they and the other eleven artworks might be . . . or who might have stolen them. THE PLAYERS: Calder, Petra, and Tommy are no strangers to heists and puzzles. Now they've been matched with two new sleuths -- Zoomy, a very small boy with very thick glasses, and Early, a girl who treasures words . . . and has a word or two to say about the missing treasure. The kids have been drawn in by the very mysterious Mrs. Sharpe, who may be playing her own kind of game with the clues. And it's not just Mrs. Sharpe who's acting suspiciously -- there's a ghost who mingles with the guards in the museum, a cat who acts like a spy, and bystanders in black jackets who keep popping up. About the author: Balliett has won the Edgar Allan Poe Award for Best Juvenile Novel, Chicago Tribune Prize for Young Adult Fiction, Chicago Public Library Foundation’s 21st Century Award, Book Sense Book of the Year Award, Great Lakes Book Award, Friends of American Writers Award, Agatha Award for Best YA Novel, Chicago Tribune’s Chicagoan of the Year for Literature, 2010, and a place in the official White House library as The Danger Box was handed to President Obama in January 2011 as a gift from the American Booksellers Association. She has appeared twice on NBC's Today Show. BLUE BALLIETT Hold Fast The bestselling author of Chasing Vermeer, The Wright 3, and the Calder Game talks about her latest novel, the story of a girl who falls into Chicago's shelter system and from there must solve the mystery of her father's strange disappearance. The amazing Blue Balliett comes to Hicklebee's! Balliett is a master at weaving a mystery. Her first book, Chasing Vermeer, won all kinds of awards and accolades including the Edgar Award, Book Sense Book of the Year Award, Chicago Tribune Prize for Young Adult Fiction and was a New York Times Notable pick. She's followed up with The Wright 3, The Calder Game & The Danger Box - all have been heartily cheered, applauded and awarded. Blue Balliet says "...This book has been years in the making, and is not only about the idea of home or lack of home. It is also, in many ways, my love poem to the written word and a celebration of the fact that our great public library system offers free power of many kinds to any and all. I do believe that a book can change a life, and that a single word, at the right moment, can prove to be as strong and valuable as a gemstone—if not more so." 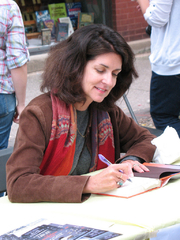 Blue Balliett - author of "Hold Fast"
The mystery begins with a bizarre accident on a deserted, wintery street in Chicago. Now stir in an old Langston Hughes book on rhythms, the Chicago Public Library's huge downtown building, a family of four that find themselves in the midst of a spiraling nightmare, and the 2003 Antwerp Diamond Heist, the biggest in history. Please bring a non-perishable food item to this event. All items will be donated to the Oconomowoc Food Pantry. Here is what the pantry is in need of: breakfast cereal, coffee, soups, peanut butter, jelly, canned vegetables and fruits, canned meat and tuna, juices, toilet paper, hamburger and tuna "helpers". Whatever you like, the clients will like! THANK YOU! Hold Fast Chicago’s own bestselling author of such children’s favorites as Chasing Vermeer and The Wright 3 celebrates the publication of her latest book. Hold Fast, set in Chicago, is the story of a girl who falls into the city's shelter system. Registration required by calling the library at 847 324-3149. Before that other debate kicks off later in the evening, Rebecca Stead and Blue Balliett square off over the issues that matter most: lying, spying, chasing, and making books. Rebecca and Blue are two of the best middle grade writers around and absolute store—employee, customer, you name it—favorites. They join us in what is sure to be a fun and lively discussion of their work and the state of children's literature. Blue Balliett , Chasing Vermeer. Blue Balliett is currently considered a "single author." If one or more works are by a distinct, homonymous authors, go ahead and split the author. Blue Balliett is composed of 8 names. You can examine and separate out names.